← With and For and Around…. A nice choice of words, in my opinion–the inelegant meatball–that workhorse of kid-friendly cuisine–can be quite heavenly indeed. The way I make meatballs is quite different from my mother’s approach. She’s a first generation Italian, arrived in the States in 1954, and as with many Italian-Americans of that era, she transformed a cuisine of scarcity and necessity into a celebration of American superabundance. When she makes meatballs, it all about the meat. She buys sirloin tip, has it ground in the store, and brings it home to produce, well, little, dense balls of meat. I prefer a much softer meatball, which means much more filler than my mother would ever dream of using–and something much closer to the meatballs my grandmother would make. Combine all the ingredients in a bowl (with your hands, of course!) and form balls. What size meatball you make is a matter of taste and utility. I will make make tiny meatballs not much bigger than a shooter marble (polpettine) for soup; I’ve even made one single, massive polpettone out of a tweaked version of the recipe above in an approximation of a Chinese clay pot dish Josh and I love. The other key for me is pan-frying. Yes, I know it would be healthier to bake the meatballs and let the oil drain away, but you lose out on that great taste and texture that comes from browning all the way around. I use a stainless steel pan with just a drizzle of olive oil to get things going. 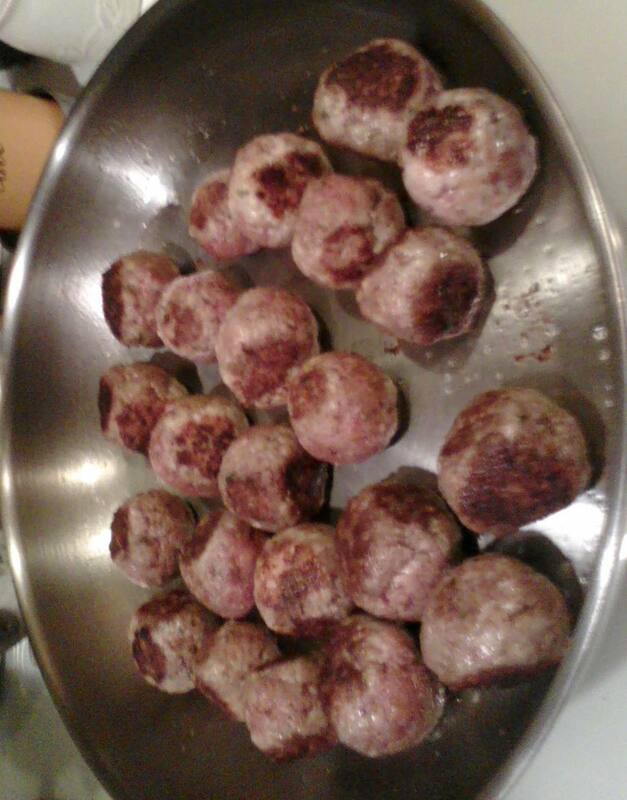 I can also fit all of the meatballs into a single frying pan without over-crowding things. What you do with your meatballs after that is up to you. When I make spaghetti with meatballs, I will get a simple sauce going in one pot (more on that some other day) while I am prepping the meatball mixture. Once I get ready to start frying, I get the water going for the pasta. If I time things right, by the time I am ready to drop the pasta, the sauce and the meatballs are done. Rather than adding meatballs to sauce, I do it the other way around–I lower the heat and then add as much sauce as I plan to use for the pasta into the frying pan with the meatballs (be prepared for lots of spattering tomato sauce). Then I let the meatballs sauté in the sauce until a minute or two before the pasta is ready to be drained. 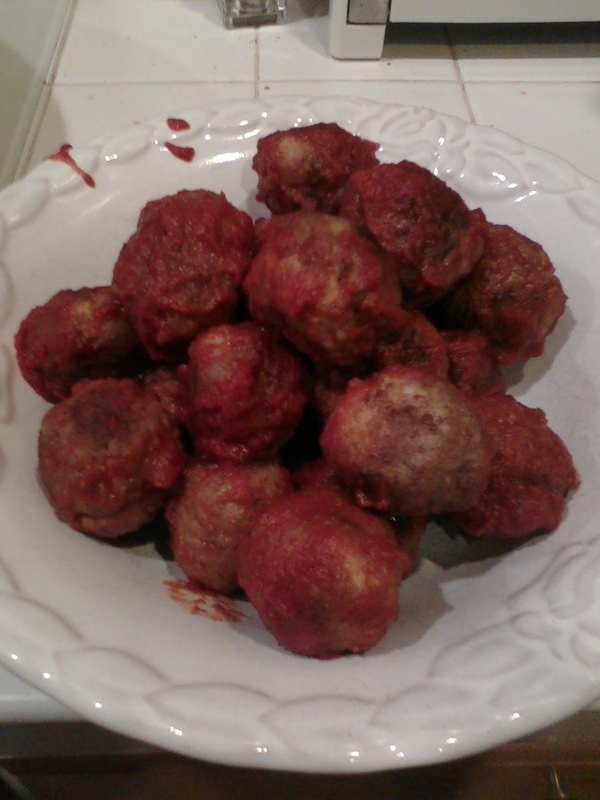 When the pasta is just a minute before al dente, pull the meatballs from the sauce and put them in a serving dish. I usually use tongs instead of a fork. Next, and last: drain your pasta and toss into the sauce in the frying pan. I try to sauce lightly, because that’s the way the majority of the family like it (Josh and I will sometimes add a bit of extra sauce to our own plates). So that’s it: simple, humble, and inelegant “paradise” in a bowl. Enjoy! This entry was posted in Uncategorized and tagged comfort food, dinner, Italian, poverty cooking, simple. Bookmark the permalink.